Virtual training is something I’m very passionate about because I’ve experienced firsthand how powerful it can be. But it recently occurred to me that if you’ve never taken any virtual training, you don’t really understand what it is. Is it eLearning? Is it pre-recorded webinars? It’s confusing! In our rapidly changing digital world, a lot of learning is offered ‘on-demand’, and virtual training often refers to anything that can be done online. I’d like to clear up the confusion and give you a behind-the-scenes look at what you can expect in a Tableau virtual training. When you attend a Tableau virtual training, you get the same deep content found in our in-person classrooms, delivered by an exceptional trainer (I should know—I used to be one of them!). But the similarities end there. Don’t get me wrong; I love our in-person classes, but the last time I attended an 8-hour, all-day training, I was wiped out! Learning new content for 8 hours a day is exciting, but exhausting. In contrast, our virtual training is delivered via Webex and scheduled over the span of a week, typically for 2 ½ hours a day (this varies per class). As an instructor, it was always so rewarding to see my students progress during the week. I loved being able to build rapport with them and see them make connections with the product and with each other. In a virtual classroom, students still build connections—with classmates across the world, instead of across the room. A question from someone in Tokyo can inspire someone who is dialed in from Denmark. Virtual training averages about 10 attendees per classroom, providing students with the classroom feel and benefits of learning from each other. Activities are scattered throughout the training sessions each day to provide hands-on opportunities to practice applying what you’ve learned. By having an instructor present, you get your questions answered before you get stuck. Additional practices are assigned as homework, to encourage further exploration. So how are questions handled during a virtual training? You simply ask your questions through your audio connection on your computer. We recommend using a headset with a microphone so your questions can be heard clearly. 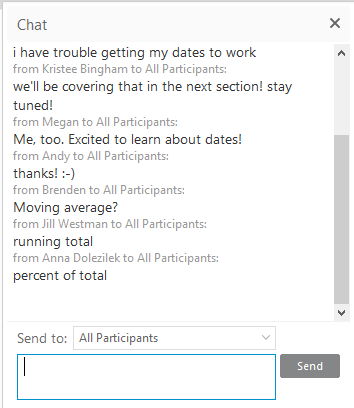 For those who don’t want to speak up in class, there’s a chat option so you can address your question directly to the instructor or to the entire class. Stuck on an issue while doing homework? Bring your questions to class the next day to discuss during the homework review period. Or, email the instructor who will be happy to guide you in the right direction. 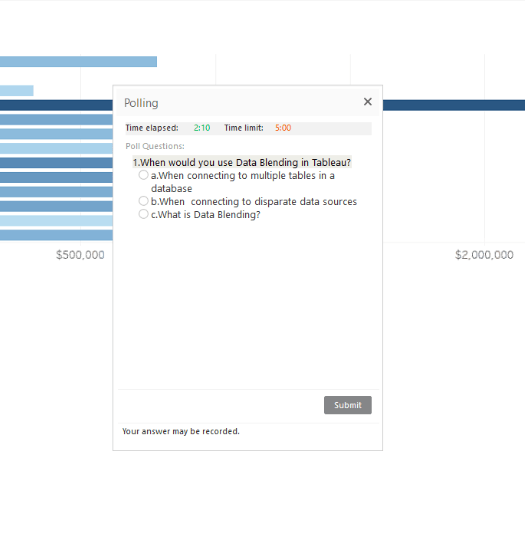 Questions aren’t a one-way street in Tableau virtual training. The instructor will use a variety of methods to engage with each attendee. Classes kick off with the instructor and students introducing themselves. This helps build a community of learning and makes it easier to interact with the class when you know a little about everyone. The instructor encourages a high level of engagement and will ask questions of the class to track their understanding of the material. Responses can be given through audio, chat, or icons. Polls are sometimes used to validate understanding. 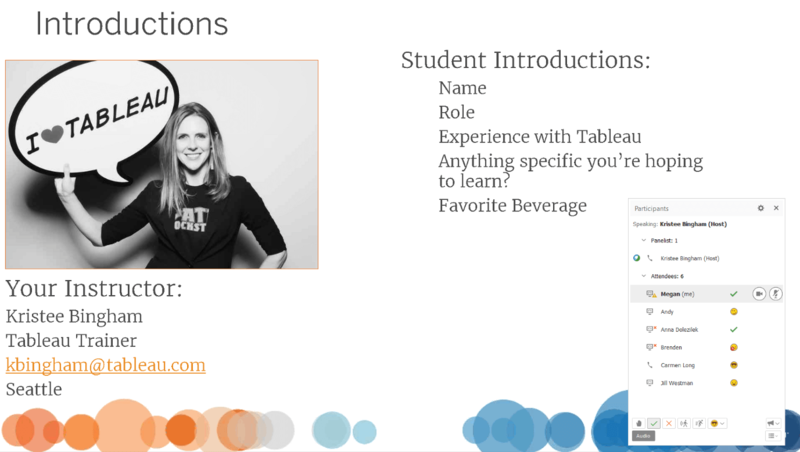 All Tableau classroom training is available in live virtual format. Our most popular classes (Desktop I and Desktop II) and are also offered in live virtual format in Spanish, Portuguese, French, German, and Japanese. Same content, only more digestible. Virtual training contains the same content as our in-person classes but broken into smaller segments. Learn a little at a time, absorb and apply the concepts, and come back the next day for more! Available anytime, anywhere. Virtual training provides the flexibility to attend classes in multiple different time zones and in six different languages. As long as you have a strong internet connection, you are good to go. Less disruptive to your daily schedule. Virtual training makes it easy to get that valuable interaction with a live instructor without even having to leave your office (or your house, for that matter). Real-time feedback. No need to struggle on your own. Ask questions of the instructor and other attendees, understand different use cases, and get the guidance you need while doing hands-on activities. More practice makes perfect. Plenty of hands-on practice time both during class and with extra homework practices. The saying, “Time flies when you’re having fun” is a good way to describe the Tableau virtual training experience. If you’re looking for a flexible and fun way to gain valuable Tableau knowledge, go virtual! Take it from me, a virtual training veteran. You’ll never look at learning the same way again. Find a virtual class today!